Retracement is a situation where the price trend pauses to show signs of reversal before continuing the initial trend. In this case, prices can form a temporary uptrend on a bearish trend, or a temporary downtrend on a bullish trend. This formation is temporary, so that soon the price will return to the main trend. This situation is often avoided by traders who prefer to wait for options when prices return to the main trend. This method is considered the most appropriate because it is difficult to take advantage of price movements that experience a retracement. The risk of a trend reversal is also one of the main factors that causes traders' reluctance to place options. Retracement is a condition that is quite often found on the price chart. Because of its temporary nature, option opportunities from retracement can increase profit potential in a shorter time. 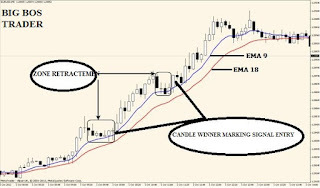 Here, you only have to wait for a candle to form at certain positions, or apply a retracement binary options strategy with the MA indicator and Fibonacci retracements. Binary options strategy this one looks at the retracement potential of the strengthening of the ongoing trend. The word 'floor' is taken from a retracement display that looks like a 'floor' in an uptrend of price movements. However, this method can still be applied to a retracement on a bearish trend. 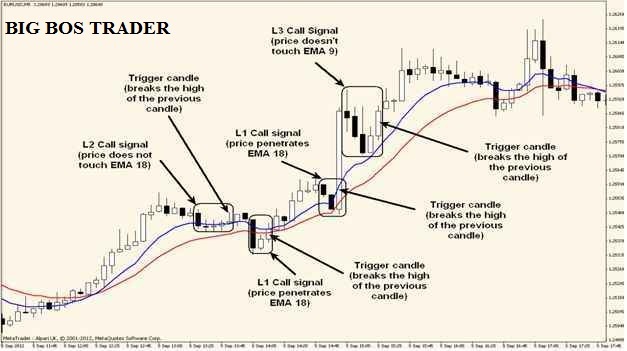 In addition to ensuring the forwarding signal on the retracement, the EMA indicator can also help determine the strength of the trading signal produced. In this case, the strength of the "call" option signal is categorized into 3 levels, namely L1 (strongest signal), L2, and L3 (weakest signal). To enter the retracement price into each of these categories, there are specific criteria that are determined to be able to recognize the profit potential and expiry time that can be taken. 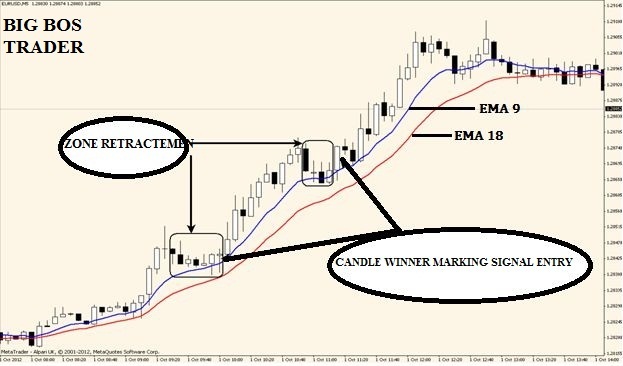 There is at least one candle touching or penetrating EMA 18. A retracement indicates a temporary downtrend entering the area between EMA 9 and EMA 18. 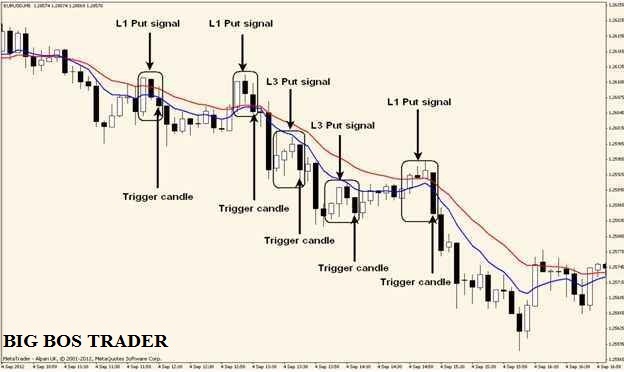 When the 18 EMA has been touched, look for a trigger candle that is higher than the previous candle, with a difference of at least 1 pips. This candle can confirm the call option signal with the highest probability. The "call" signal appears before EMA 18 is touched. In this situation, prices have started to rise even though they have not had time to touch EMA 18. This price position can already be the right entry level, but with lower profit potential because the next price increase will not reach a significant level. The decline in prices that form the retracement on the bullish trend is not too significant, so the price does not enter the EMA 9 and EMA 18 area. In some cases, the price may only touch the EMA 9. The "call" signal appears after or before the price touches the EMA 9. This category has the lowest possible level, because prices can re-experience a retracement after rising only in a few candles. The higher the retracement position against the EMA, the smaller the trading opportunities generated. If you use this setup, and find retracement conditions with the L3 category, you need to be careful in determining the strike price and expiry time to be selected. Make sure if the price is still continuing its uptrend and not re-forming the retracement when your expiry time is up. The L3 "call" signal is indicated as the most rare, and can only be found when price performance is at new high levels. Strong price consolidation can also lead to the formation of retracement with this category. The advantage of using this strategy lies in the number of trading opportunities that appear in one major trend formation. If you can maximize this method, it is not impossible that you can make a profit by opening more options from a period. Given the suitability of this method for short-term trading, you can also apply daily trading or minutes with the selection of time frames that have been adjusted. 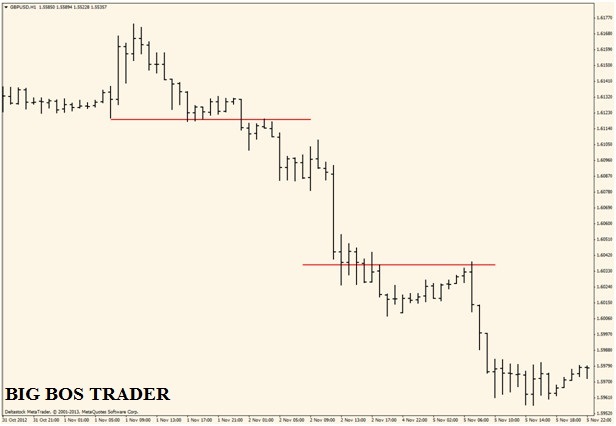 As in the example image above that uses the M5 time frame, you have the potential to gain profit several times a day if you can use the floor trader strategy with the right analysis and expiry time. Undeniably, Fibonacci retracement is one of the most popular indicators among traders, both in the forex market and binary options. Calculation of price levels in such a way can actually facilitate analysis on price movements. However, not a few traders find it difficult to use this indicator, especially in terms of determining the right swing high and swing low. Basically, the Fibonacci retracement is useful to show the retracement area of ​​a trend. Breakout of prices from Fibonacci levels is also often a strong indication of the continuation and reversal of existing trends. For a retracement utilization strategy in binary options, you need to find the right retracement area. This method is done by focusing on price levels that are unable to move further from the retracement area. Fibonacci levels consist of 23.6%, 38.2%, 50.0%, 61.8%, and 100.0%. One level that is often referred to as the "magic" level in Fibonacci is 61.8%. This is because, prices that experience a retracement tend to have difficulty penetrating this level. Thus, the price breakout at 61.8% at the same time can also be interpreted as a reversal. To confirm the forwarding signal from this retracement, you can use a price action strategy by observing a reversal candle pattern that will bring the price bouncing and returning to the main trend. In forwarding the uptrend condition, drawing the Fibonacci line starts from the lowest price level (swing low) towards the position of the highest price (swing high). 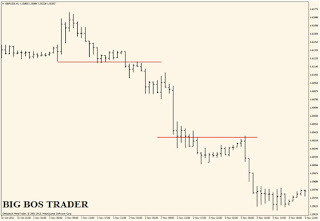 In the example below, you can see that the swing low is at the 1.35150 level, with the price retracement limit held at the 61.8% level. 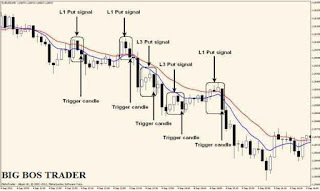 From this situation, you can immediately place the "call" option or wait for signal confirmation from the formation of the next candle. The bullish engulfing formation can be used as a price indicator to bounce back towards a higher level and continue the bullish trend. Withdrawal of the Fibonacci line starts from the swing high towards the swing low. It is seen that the price is only able to reach the level of 50.0%, before then moving back down and penetrating the previous lowest level. The beginning of the continuation of the bearish trend can be identified from the failure of the price to break the resistance level of 50.0%, which is further confirmed by the formation of bearish engulfing pattern. 1. To anticipate a reversal, pay attention to the release of fundamental data at certain times. Strengthening a trend will not be reversed without the fundamental influence of a news release that greatly affects the value of an instrument. Therefore, even though the market is trending strongly, you need to be careful when placing options at important news releases, so as not to be affected by the surge in volatility that can affect current price trends. 2. The principle of support and resistance can be a powerful method in analyzing possible prices, both to stay in the path of a trend or breakout to form a new trend. In this case, the 9 EMA and 18 EMA can be used as resistance when there is a bearish trend, or the support level is on a bullish trend. Likewise with the Fibonacci retracement, the 61.8% or 50.0% level failed to be broken by a reversal while the price can function as a support or resistance point. 3. 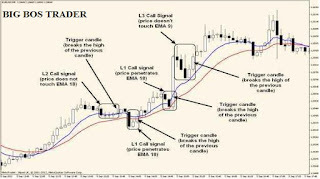 On the floor trader strategy, the strongest trading signal appears at the first retracement after a new trend is formed from the EMA line crossing. So, the opportunity to trade in this position will be a pity if it is not immediately utilized, especially if the retracement appears to meet the criteria of the L1 category. 4. Still from the floor trader strategy, retracement can occur in vulnerable adjacent time. If you have placed an option at the first retracement, you should not open the option again on the signal that appears from the advanced retracement. Try to reanalyze this trend forwarding, taking into account the timing of the news release or using trend strength measurement indicators such as ADX. If the trend looks to be continuing, you can again place an option on the next retracement, after ensuring that the pullback occurs at a significant distance and time range from your first retracement. 0 Response to "Utilizing Retracement as a Binary Options Trading Opportunity"